You may have noticed patterns in your neighborhood over the years: adjacent buildings reach to similar heights, businesses cluster on certain streets, the concrete crevice behind your building looks to be the same shape as the lots that surround it. These similarities are more the result of the City’s zoning code — an underlying structure of regulations that guide how land can be developed in terms of the use, size, and shape of structures — than a function of aesthetics or style. Over the last twelve years, the Bloomberg administration’s rezoning of 37% of the city also gave many citizens first-hand experience of the effects of zoning changes. While in some cases the low density of outer-borough, suburban neighborhoods was effectively preserved, rezonings also dramatically reshaped others. As a result, the visual character and lived experience of many neighborhoods have rapidly shifted. The Center for Urban Pedagogy (CUP) is a non-profit organization that uses art and design to break down complex urban issues — from street vendor regulations to perspectives on micro-apartments — into simple, accessible, visual explanations. After hearing of the difficulties its community partners had relating the complexities of zoning to their constituents, CUP set out to create a toolkit and workshop to better explain the code. The resulting What Is Zoning? toolkit is the second in CUP’s Envisioning Development series that explores topics and processes key to what is built in our cities. CUP Executive Director Christine Gaspar sat down with us to walk through the core concepts of New York City zoning, the organization’s methods for breaking down complexity and empowering citizens, and the lessons that process provides for building more inclusive, truly public processes. —J.T. What is the Envisioning Development series? CUP started Envisioning Development in 2007 to address three issues that we heard always proved especially challenging for community organizers to explain to their constituents. The first was affordable housing, the second was zoning, and the third was the Uniform Land Use Review Procedure or, as it is commonly abbreviated, ULURP. Organizers would bring people together to discuss, say, affordable housing, and they would spend an hour getting everyone in the room to understand the definition before they could even get to the point where they were organizing around affordability in their neighborhood. They felt like there had to be a way to develop tools to make that information easier to understand, so they reached out to us to help them do that. We started with the What Is Affordable Housing? toolkit, which we launched in early 2010; we just launched the What Is Zoning? toolkit in the fall; and we hope to launch the ULURP toolkit in 2015. Zoning is a negotiation: it’s a balance between the public good and private property rights. Each of these topics bleeds into one another. Inclusionary zoning works across both affordable housing and zoning, as it’s a special zoning designation that incentivizes the development of affordable housing in exchange for allowing bigger structures. In the zoning workshop, we also often end up talking about ULURP, because major land use changes, including rezonings, have to go through it. It’s a multi-step review process where community boards, borough presidents, the City Planning Commission, the City Council, and the mayor all get to vote on whether these projects should move forward or not. There are several points in the process when residents can voice their opinion on the projects at community hearings. But we’ve found that by the time communities know that this process is underway, most of the large decisions have already been made. We’re trying to figure out the right way to empower people when so much happens early on and behind closed doors. What was the catalyst for the creation of the zoning toolkit, and who is its audience? The toolkit came about largely in response to the many rezonings passed under the Bloomberg administration. Many people were really confused about what they meant. The series originated in our work with grassroots organizers in low-income communities of color — groups historically underrepresented in City decision-making. I do think it can work for other audiences as well. Our baseline assumption is that people know nothing about zoning. We start from scratch and build up. Let’s start from scratch — what is zoning? We describe it as how the City literally breaks up its land into different zones that allow different uses and activities. Each of these zones allows different sizes and, in some cases, shapes of construction. So zoning has two fundamental components. The first determines where each type of land use — residential, commercial, or manufacturing — can go, what can go together and what should be separated. The second determines what the overall size and shape of buildings can be. These decisions are big. And they can get very political. Zoning has a huge impact on the quality of life of people living in the neighborhoods across the city, and it impacts what kind of money people can make off their real estate. Zoning is a negotiation: it’s a balance between the public good and private property rights. Ideally and in theory, we’re all playing by the same rules. A property owner might be mad that she can only build a 6-story building on her lot, but is probably relieved that the people on either side can’t build a 15-story building. In practice, we certainly see that some people are better at manipulating the zoning code than others. Zoning works across many scales, as the CUP What Is Zoning? guidebook explains. What is the difference between zoning and planning more generally? Zoning is just one tool that planners can use to shape the city, to plan for growth and development, lack of growth, or even shrinkage. Zoning doesn’t actually change what’s on the ground. It just changes the rules that people have to play by when making building decisions. If I “upzone” a neighborhood, meaning I rezone it to allow larger developments, that doesn’t necessarily mean that all the buildings are going to get bigger. It means that the people making decisions about what to do with their property now have a different set of incentives to respond to. There are many other pieces of the planning puzzle that go beyond zoning. For example, tax structures can be used to encourage different behaviors that would impact planning decisions. It depends on the city — some cities just do zoning and not much planning. Personally, I believe in comprehensive planning, and I think it’s strange that New York doesn’t want to do it. In some ways, the Bloomberg rezonings were comprehensive in their strategy, specifically those that sought to increase density around transit. But we also saw big upzonings where, all of sudden, transit and education infrastructure weren’t in place to support the new populations that came with the resulting development. What is the history of how zoning has been used in New York City? The history of zoning in early 20th century New York is in some ways the early history of zoning in the United States. The origin story of “size and shape” zoning is that of the Equitable Building, a skyscraper downtown. It looks like the boundaries of the lot were extruded straight up: a solid mass with no setbacks at the upper levels. After it was built, people pushed the City to enact regulations for how a building would get built out so that massive structures wouldn’t block all light to the street. This is when we start getting the wedding cake building profiles particularly common in Manhattan. How do you go about breaking down the complexity of zoning in the workshop and toolkit? We strip things down to essentials and forego many of the nooks and crannies of the code. We provide a good foundation so if people are in a situation where they need to know more, they can make sense of the details in the context of a framework. Then we try to figure out how to turn those fundamentals into an activity so that people can learn through experience. As a learning process, discovery is far more memorable than taking notes. So, the toolkit is designed as a two-sided game board with plastic blocks. Each side of the board is paired with a set of activities that lets people explore the use or the size and shape aspects of zoning. What would you say is the hardest zoning concept to grasp and how does the toolkit make it more understandable? Floor Area Ratio (FAR) — the ratio of total square footage of all of the floors in the building to the total square footage of the lot that the building sits on — is probably the hardest thing to grasp. A one-story building that completely covers the lot that it sits on has an FAR of 1.0. But a two-story building that completely covers the lot has an FAR of 2.0. But then you can reconfigure the building so that doesn’t cover the whole lot and still get those same numbers, which is where it gets confusing. Explaining FAR was in some ways the starting point for the whole set of activities in the zoning toolkit. We asked, what’s the easiest way to help people figure out FAR? Blocks! Let’s give them blocks and a set of activities that lets them build at different FARs. That way, people build an intuitive as well as a technical understanding of what it means when you have a FAR of 2.0 versus 4.0. We find that it’s really effective. As soon as you put the blocks in front of people, everyone immediately starts playing with them. You don’t have to convince anyone to participate. We think a lot about how to create a visual environment that’s non-threatening, especially when you are dealing with an issue that’s stressful, complicated, and may affect whether or not you can afford to stay in your home. We want things to feel familiar and accessible and to avoid people feeling that they might not understand the concept. How have you seen the toolkit being used thus far? Community organizations around the city are starting to use the toolkit. CAAAV, a grassroots organization working in Chinatown, is currently facilitating a lot of conversations with it. These tools are really good for giving people a baseline so that they can have an informed conversation and work together to develop an agenda. We’ve seen the affordable housing toolkit used in a ton of different ways over the last four years, in contexts we didn’t anticipate. Organizers use it to educate their constituents, affordable housing developers have used it to train their staff, and we’ve even seen a group that works with low- to moderate-income communities trying to buy their building and turn it into a co-op use the tool within that structure. Two groups with opposing viewpoints on how the Domino Sugar development should incorporate affordable housing used it, which was really interesting. And people in other cities are using it. We’ve been adapting it for Chicago over the last year and if there is an audience for the zoning toolkit in other towns, we would look into expanding that as well. We get especially excited when city agencies – especially those invested in people understanding what’s going on — get excited about the tools. Just being involved in the workshops and seeing the information click with people is rewarding. When CUP first started using visuals and hands-on tools to teach complex issues, it was on a bit of a hunch. But there’s a lot more research now about the effectiveness of that type of learning. It’s exciting to get to test it and see it working. As you were saying, zoning codes are unique to their cities. What can the code tell us about New York specifically, how its built environment is formed, and how that ties in with the priorities of its citizens and government? New York is somewhat unusual. When you look at land uses and zoning codes in other cities, you usually see a whole host of them: institutional uses, open space, etc. In New York, there are really just three designations: residential, commercial, and manufacturing; everything either fits into one of those or gets integrated as some sort of overlay. In some ways it’s frustrating that you can’t deploy other land use types in zoning here, but in other ways, it makes the code quite flexible. The idea is that everything is what you might call “mixed-use.” A neighborhood marked with an R for residential on the map may still have many types of uses, including schools, community centers, doctor offices, parks, and places of worship. That diversity of uses shows the vibrancy and flexibility of New York neighborhoods. But that also means the City has flexibility in what it wants to do, and I think that can be good or bad for the neighborhoods it rezones. 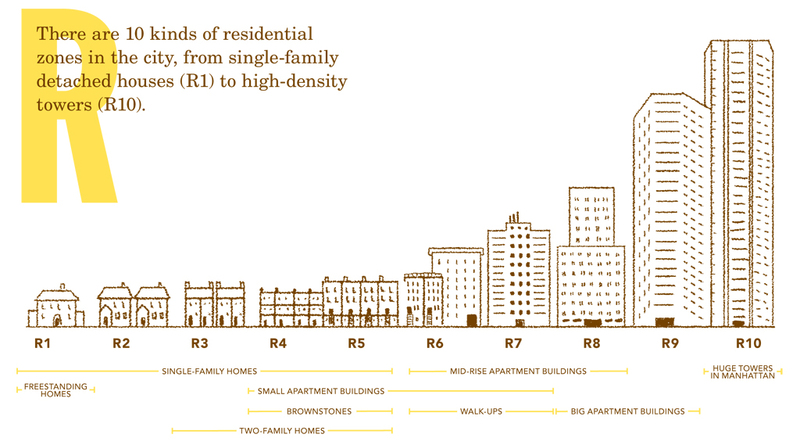 One aspect of zoning in New York City that I find a bit sinister is MX rezoning. MX stands for mixed-use, and in the planning world mixed-use connotes good things: residential above commercial and a vibrant street life. But in New York City zoning code, an MX zone is a manufacturing zone that’s been rezoned to allow residential and commercial uses in addition to the existing manufacturing. In practice, this usually means that all the manufacturing is about to get shunted out of that neighborhood because the residential and commercial uses bring in much higher rents. In the last 20 years, MX rezonings were really a way to take formerly industrial neighborhoods and turn them into higher income residential areas, which we saw happen in Greenpoint and Williamsburg. What are some examples of the other kinds of distinct designations the City uses beyond the foundational uses — residential, commercial, and manufacturing — in the zoning code? The City calls these “special districts.” There are around 30 of them, and they’re really varied. There’s a special district that’s a nature preserve and then there’s one for the Harlem cultural district on 125th Street. And, in a rezoning, if a community or other party succeeds in adding additional rules beyond ones that are normally considered part of an existing zoning designation – like asking for an anti-harassment area so existing tenants aren’t harassed by their landlords as the opportunity to charge higher rents comes in — the City makes that a special district. It’s a very limiting way to zone, and it seems like special districts are a back door way around the structure of New York City zoning. What is your perspective on the code’s current state and the way it is enacted? I don’t think there’s anything inherently bad about the zoning code. Like I said, it’s a negotiation and a balance between public good and private rights. People are always going to disagree with what that balance should be. There could be more community participation in zoning decisions, and I think it’s really hard for communities, especially under-resourced ones, to have a say in decisions that impact their neighborhoods, particularly in the ULURP process. Even though it is a kind of public review process, it’s not very good at getting public input. There’s also a communication issue. We’ve seen people get upset because they thought they were having an upzoning when in fact their neighborhood was being downzoned. One place that the City could improve its communication around zoning is in the maps. They’re really, really poor visually, and we work with many graphic designers that would be very excited to make them more accessible and understandable. It could be a lot easier for people to be involved than it is right now. We’re working to help people have more of a say and to understand what’s happening so they can be more effectively engaged. Unless otherwise noted, all images courtesy of the Center for Urban Pedagogy. What Is Zoning? was developed by Christine Gaspar, Mark Torrey, John Mangin, and Rosten Woo and produced by Gaspar and Torrey with design work by Jeff Lai and Andrew Sloat. The toolkit and guidebook can be purchased from CUP and a PDF of the guidebook downloaded on their website. Contact Mark Torrey at mark (at) welcometocup.org to request a workshop or training. Christine Gaspar is Executive Director of the Center for Urban Pedagogy (CUP). She has over ten years of experience in community design. Prior to joining CUP, she was Assistant Director of the Gulf Coast Community Design Studio in Biloxi, Mississippi, where she provided architectural design and city planning services to low-income communities recovering from Hurricane Katrina. She holds Masters in Architecture and in City Planning from MIT, and a Bachelor of Arts from Brown University. Christine, What is Zoning? Your presentation, the guidebook is so lovely, I almost believe rezoning can be a good thing. The guidebook is so easy to understand – well executed with such class and wonderful color.I truly enjoyed reading the the guide from cover to cover.The guide is a great tool for communities “at risk”. By that I mean where developers and the City Planning Commission and local politics often have their way with underhanded rezoning,like mixed use. This guide will help local communities see more clearly and understand what is a stake, when it comes to zoning in their own neighborhoods.